Last week I was on holidays in Indonesia and couldn’t resist a bike riding tour in Bali. My week long holiday was focused on rest and relaxation, but like most of my holidays I found an excuse to ride a bike. I was travelling with a group of 11 people including a few who don’t ride regularly, so we wanted to find a tour that would suit all of us. We found Happy Bike Tours via an internet search and we couldn’t have been happier. We had a slight hiccup with our booking so I’d recommend that you reconfirm a few days before with Made who owns and runs Happy Bike Tours. The tour was by no means I challenging bike ride, rather it was a great way to cruise along and see ‘real’ Bali up close. Australians visit Bali in droves, but many never leave the beachside resorts, and they really don’t know what they’re missing. Made’s bike tour gave us the chance to see how Balinese people live and work, plus take in some amazing scenery. Our guide named Putu was funny and informative. The ride itself was a gentle downhill roll of about 18 kilometres. The bikes provided by Happy Bike Tours were very basic entry-level mountain bikes but were quite adequate for the type of riding we did and helmets were provided. It rained a fair bit while we were riding and the bikes were up to the task. We visited a traditional Balinese home and enjoyed hearing about how the house is laid out to accommodate several generations of one family, with the mandatory Hindu temple incorporated in the north east corner. The part I enjoyed the most was cruising through the small villages on quiet back roads and interacting with the locals who were happy to exchange a quick hello as we rode through, plus a few high fives with local school children. Towards the end of the ride we had to ascend a couple of small hills so we got a small workout in the process. For those who struggled a little uphill, our very helpful guides were on-hand to provide a push. To end the tour we visited Made’s house and enjoyed a Balinese feast prepared by his wife. 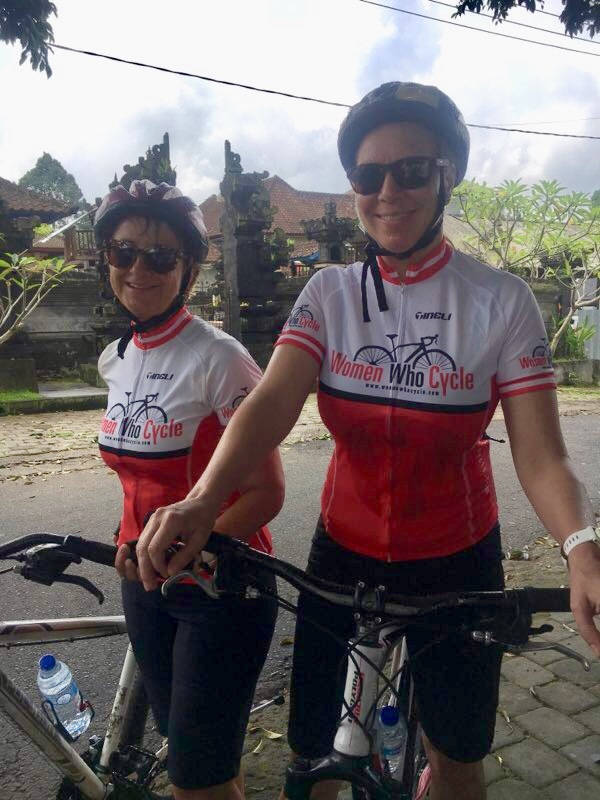 Have you done a bike riding tour in Bali? 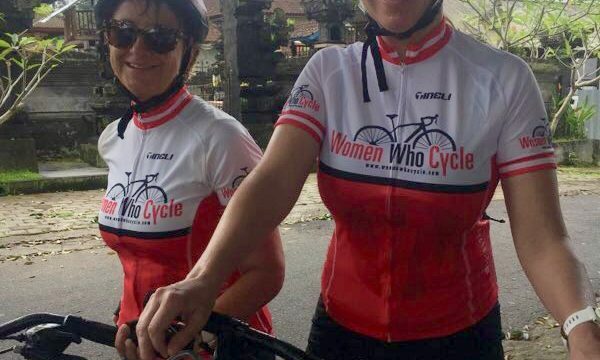 Share your experiences via comments for the Women Who Cycle Facebook page.